I’m a late Laura Kinsale convert. Her first book was published when I was still a kid, but in my early absorption with Julie Garwood and a whole host of Harlequin titles (which could be had for 25 cents each from my local used bookstore), I never ran across her work. It wasn’t until I started reading romance blogs and her name kept coming up as the best of the best of romance authors that I picked up Prince of Midnight. And then Flowers From the Storm. And then everything else she has ever written. In Prince of Midnight, S.T. Maitland is a former highwayman. The reason he stopped marauding is that he suffered an injury that caused permanent dizziness and deafness in one ear. He has shut himself up in a crumbling chateau above a tiny French village. He’s not exactly wallowing in self-pity and penury–he has too healthy a sense of humor for that–but he’s not far from it either. His only friends are an innkeeper he owes money and an honest-to-goodness wolf named Nemo. He spends his time defending his kitchen garden from rabbits and creating paintings he can never seem to finish. It’s a sad come-down for a man who was once the terror of the English countryside. When practical Leigh Strachan arrives on the scene, she has revenge on her mind. A cult-like figure has murdered her family and she wants the Prince of Midnight to teach her all he knows in order to enact her own justice. She’s not at all impressed when presented with S.T. as he is now. She is actually pretty annoyed when he insists on accompanying her back to her hometown to take on her nemesis. And though it gradually becomes obvious to the reader that S.T. is not as useless as he might first appear, it takes Leigh a lot longer to figure that out. What follows is a pretty non-standard road trip romance that just keeps miring the protagonists deeper in both internal and external conflict, which is another thing I love about Kinsale’s books. Even though we get our HEA, it remains in actual real doubt for about 95% of the novel. Though the plot is a bit cumbersome at times, the characters of S.T. and Leigh carry the novel, working through their pain and loss separately and then eventually together. A lot of reviewers have problems with Leigh. She is abrasive and difficult and mercenary in her pain, but that just felt real to me. Though she has been hurt, she hangs onto her innate strength with claws and teeth, which isn’t always pretty. The scene where Kinsale uses the process of S.T. teaching Leigh to gentle an abused horse represented a turning point in the novel for me. It’s the point where I learned to trust Kinsale unconditionally. It’s also where I fell in love forever with S.T., not because of his capability, but how he takes both the horse and Leigh and opens the gate to a different path, one of love instead of pain. Prince of Midnight has high adventure, a swashbuckling hero, a heroine who learns to trust herself again and several wonderful four-legged characters. The language is literarily lovely and the love story unpredictable. All this adds up to a book that I will reread over and over again for years to come. I can’t recommend it highly enough. Early on in Prince of Midnight, Kinsale spends some time talking about S.T.’s chickens. He can’t manage to kill them himself and figures when the time comes, he’ll have his pet wolf do it. It’s one of the first moments where we get a glimpse of the reality of S.T.’s internal landscape and it stuck with me. 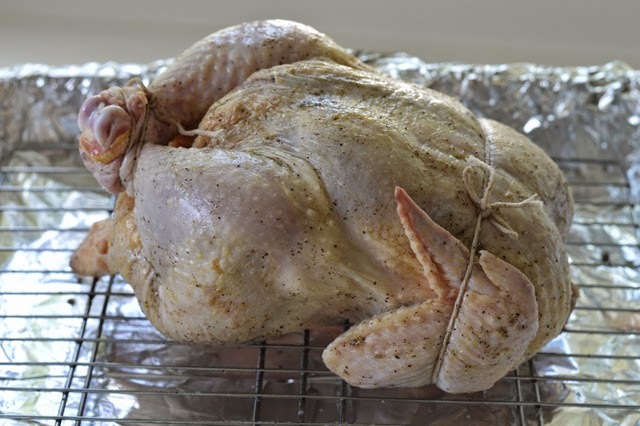 Roasting chicken isn’t hard. Just make sure the wingtips point toward the ceiling. However, if S.T. had ever managed to pick a chicken, here’s something he probably could have cooked up. If he had any gardening skills. Or cooking skills. Or really any skills at all that aren’t related to swinging a sword, gentling a horse or painting. 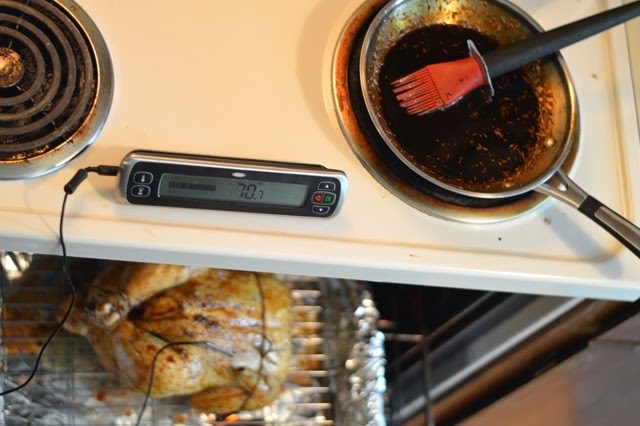 A meat thermometer helps a lot. It just beeps at you when the chicken is done. This version takes a little over an hour. If you’re not a housewife like I am, Roasted Bourbon-Rosemary Chicken from Garden & Gun magazine might be best saved for a Sunday night. This chicken takes about an hour and fifteen minutes so grab a glass of wine and your current book and have a snack before you start. 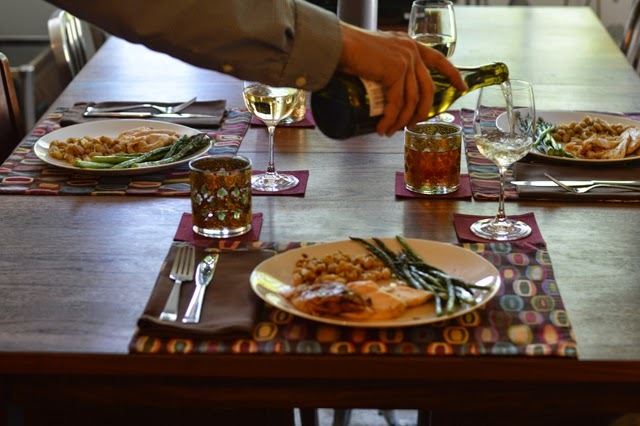 It makes a great lazy dinner, plus you have leftover meat for sandwiches during the week. I also save the carcasses for a cheap source of chicken stock. I just stick them in the freezer until I have time to babysit boiling bones for a couple of hours. 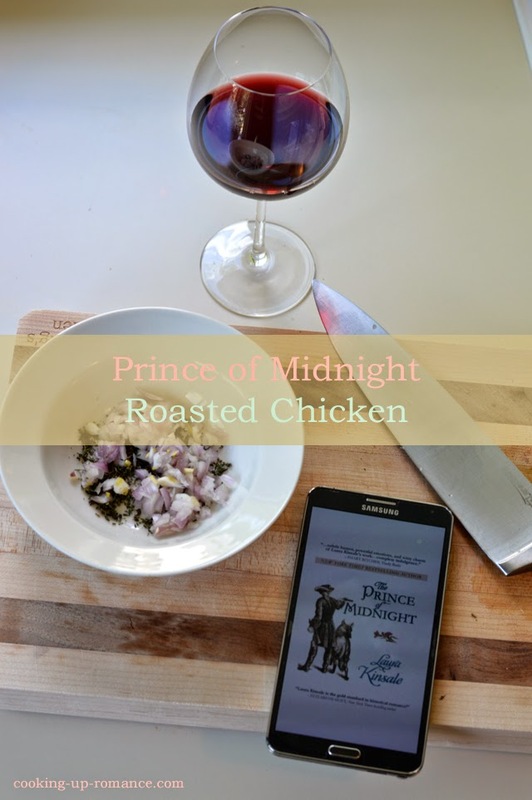 For true Prince of Midnight flavor, use a free range chicken. These white beans are amazing. We had a friend over for these and he agreed that he didn’t know beans could be this good. 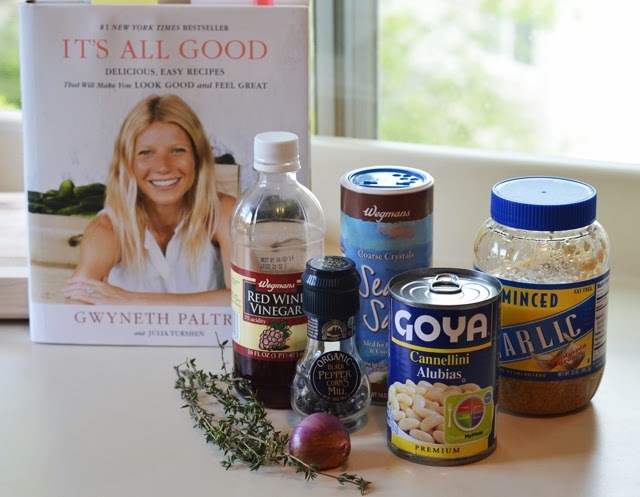 The white beans are from It’s All Good, which is Gwyneth Paltrow’s cookbook. I’m not a big fan of celebrity cookbooks, celebrity diets or celebrity anything really, but this book is phenomenal. I’m printing the recipe below just to convince you to buy it and because I think 3-4 minutes is waaayyy too long to cook garlic. Seriously though, never has healthy tasted this good. Plus, it amuses me that these are Italian beans cooked in a French style. That will make more sense if you have read Kinsale’s book and appreciate the research that she clearly put into it. The roasted asparagus is just a simple alternative to boiling or steaming. This and the beans are so quick, they’d even make an easy addition to any weeknight meal. It’s also May so no matter where you live, asparagus should be popping up in your local farmer’s market just now. It’s skinny and fresh and perfect so it was a clear choice for this late spring meal. 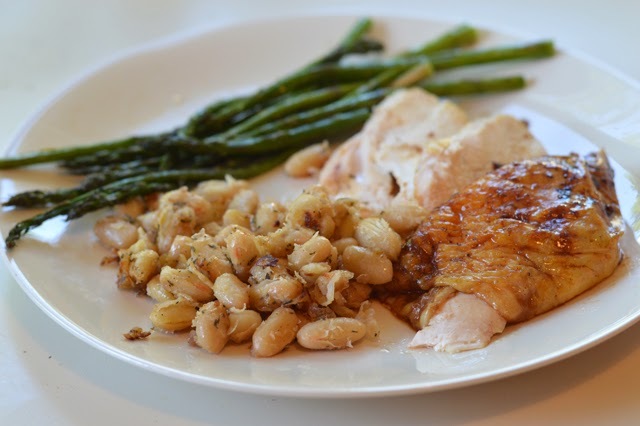 As for timing, when you pull the chicken out of the oven to rest, you can start the asparagus and the beans and you’ll be eating within 15 minutes. 1. Heat the olive oil in a large non-stick skillet over medium heat. Add the garlic and cook for 1 minute. 2. Add the thyme and shallot and cook for 1 minute more until the shallot is just softened. 3. Add the beans and cook, stirring occasionally, for 5 minutes. 4. Add a healthy pinch of sea salt, a few grinds of pepper and the vinegar and cook for 5 minutes more. 1. Preheat the oven to 500 degrees and prepare a cookie sheet by covering it with foil. 2. Rinse, drain and trim the bottom ends of the asparagus. The “snap off the end at the weakest point” thing is a myth. Just chop about an inch and a half off the bottom. If they’re late season and very thick, you may want to peel them. Place them on the cookie sheet. 3. 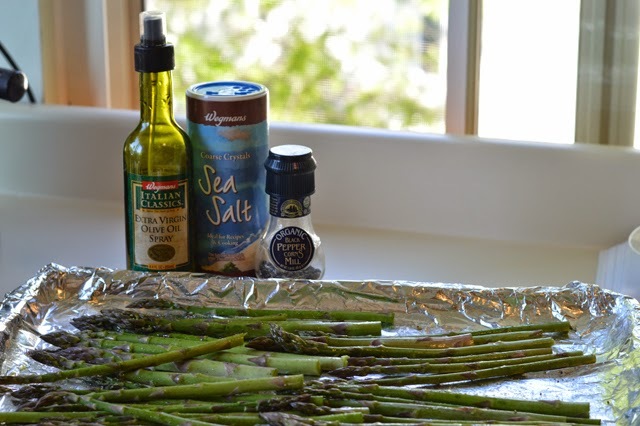 Sprinkle olive oil or spray the asparagus. 4. Add a generous pinch of salt and a few grinds of black pepper. Shake to coat. 5. 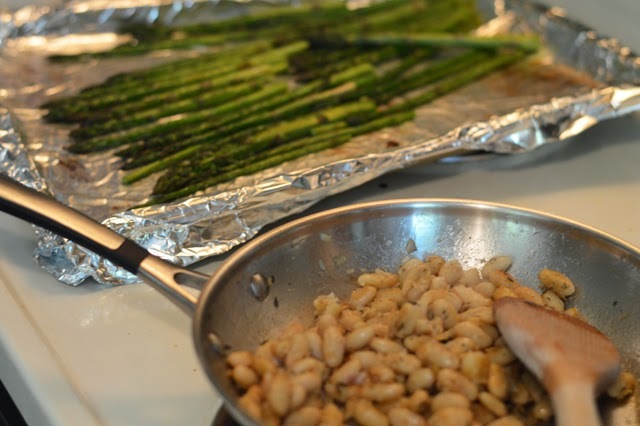 Roast in the oven for 8-10 minutes depending on the thickness of your asparagus. 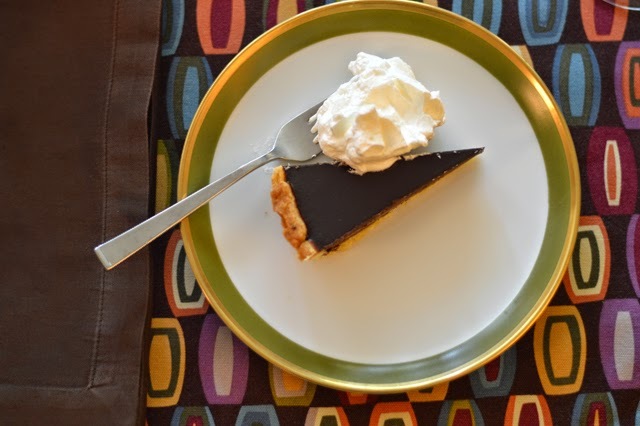 Stop by again next Monday when I review Delphine Dryden’s newest book, Mai Tai for 2 and give you the recipe for this Chocolate Macadamia Tart with Coconut Whipped Cream. The book was great and this tart will be the best thing you’ve ever eaten. Seriously. I also loved most of Laura Kinsale's books. She was way ahead of her time in creating deeply damaged and vulnerable heroes who needed a great deal of TLC to redeem them. The damaged heroes in most old school romances overcompensated by being violent alpholes. Have you read Shadowheart? I never did, since the plot did not appeal to me. I have heard that it was not well-received and that it was rapey, which surprised and alienated many of Kinsale's fans. One reviewer on Amazon pointed out that there was very little of the hero's POV, which is also unusual for Kinsale. I eagerly read her Lessons in French when it came out a few years ago, but I was a bit disappointed. I don't know if my tastes have changed, or if there are just so many authors who have been influenced by Kinsale that her heroes no longer seem as special. Flowers from the Storm is probably my favorite of hers. I re-read it several years ago and still loved it.